This is a frustrating article to write because it’s difficult to believe that this type of Cultural Marxism could happen in the United States. Yet that appears to be the case and in reality, Christians should not be surprised since the Bible warns of this increasing trend. Pamela Geller recently reported on a situation that occurred in Florida titled, “Rollins College Muslima professor gets Christian Student SUSPENDED for blasphemy.” In it, she asserts that a Christian – who happens to be a straight-A student, was actually suspended for comments he is accused of making to a female professor at Rollins College during a debate regarding aspects of Islam. The tragedy here is that because the professor spoke out against the student (even giving him low grades in spite of his straight-A status), the college and law enforcement supports the professor. This is in spite of any evidence to support her claims. Her accusations included that the student made her feel “unsafe” (a favorite accusation of the Fascist Left), and also accused him of harassing her on campus. The student claims he was not on campus (and has an alibi), at the time she accused him of being there, yet her accusation is part of the reason for the suspension. Now, he has to get statements from other students supporting his claim that he was not there and that the situation in the classroom did not unfold as the professor claims. I will say this again as I’ve said it numerous times before. The only reason the Fascist Left and Islam appear to be working together or can even be on the same team (at least temporarily), is because the overall goal of Cultural Marxism (leftism) is to destroy Western Civilization and Christianity itself. Islam has this same goal. Apart from this, Cultural Marxism and Islam are not compatible in the least, but on this one overarching goal they agree and unofficially support one another for the time being. We’ve seen how this works on many occasions. Even now, because of Prime Minister Trudeau in Canada, work is underway to make it a crime to say anything perceived as negative against Islam (or “Islamophobic). Free speech is taking another hit in western countries. With the recent terrorist attack in England near the Parliament, in which several were killed and many injured after a Muslim rammed his car into people, then got out and began stabbing them, we have learned from the authorities in the UK that they may never know the motive of Khalid Masood, the individual who was apparently turned to radical Islam while in prison. Even though Masood was (now deceased), a Muslim coupled with the fact that ISIS is celebrating his death as a victory for Allah, the authorities in England are still scratching their heads over the whole incident as to why he did what he did. Numerous leaders have come out to state unequivocally that simply because Masood was a Muslim has nothing at all to do with anything. Actually, it does. Geller also writes about a 5-year-old girl in Idaho who was raped and sodomized by several Muslim “refugees.” One might think that these boys would be apprehended, charged, found guilty, and jailed especially because they were discovered in the act by a neighbor. Not so as it would seem law enforcement and local authorities have done everything they can to resist the girl and her parents and support the boys who perpetrated the crime. Read the linked article at the beginning of this paragraph for the details. Of course, the Rockville, MD crime involving two aliens illegally in the USA (allowed in under Obama), in which they raped/sodomized a 14-year-old girl in a locked bathroom has virtually received no air time on any of the major news networks except FOX News. The superintendent of schools has accused parents of being racist and insists that schools in Rockville are safe. Tell that to the girl who suffered these crimes. The young men’s attorney is arguing that the acts were consensual and preplanned. It’s the old “she deserved it” routine in which the crimes are minimized and attempts made to paint the victim as promiscuous and “asking for it.” All of these tragic events should tell us that those in charge are giving Islam a pass. So not only is America having to deal with unchecked Islam and people illegally in the United States making a mockery of our laws and practices, we also have the fascist left’s AntiFa thugs attempting to shut down proTrump rallies. The video below is merely one example of these criminals disrupting rallies. Several AntiFa thugs were ultimately hauled off and charged with criminal use of pepper spray, a felony. With the election of Donald Trump as this nation’s 45th president, the Fascist Left and globalists alike have been put on notice. While many conservatives are concerned about Trump, his motives, and what he may or may not accomplish, there is another way to see things regarding Trump. First of all, America did not come to this low point overnight. It’s taken well over eight years to get here and in reality, today’s societal trends are the results of Bill Clinton’s tenure as president as well as both Bushes and Obama’s. Even Reagan had a hand in bringing about some of the things we’re seeing today, though it could be argued he may not have been aware of it through his judicial appointments, etc. But if we look carefully at the things that have transpired over the past 30 years or more, it’s clear that each president chipped away at freedoms for Americans, including Bush Jr. Some, certainly more than others, with the greatest push toward Marxism occurring during the Obama Administration’s eight years. 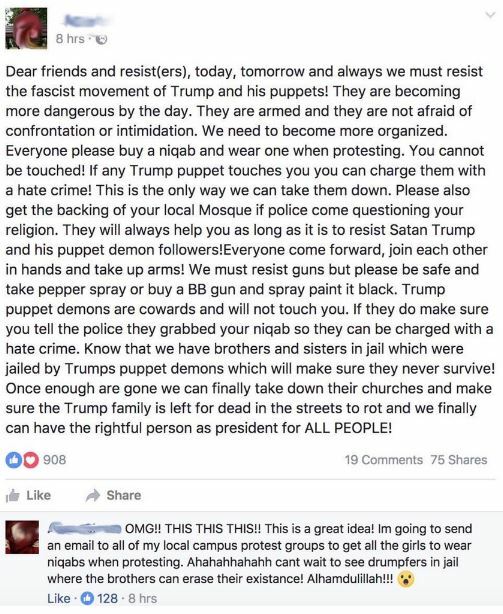 Post on social network explaining plan to dress like Muslims, then claim “hate crime” if proTrumpers fight back. Note also collusion with local mosques. The fact that Trump has been able to accomplish anything so far is quite a testimony. He’s working against RINOs (Republicans in Name Only), like McCain, Ryan, Graham, McConnell and many others. Then he’s got to contend with the Democrats whose party has largely been taken over by the far left. It’s not an easy road to hoe and the Democrats have been working against the law of the land for some time. Second, if all Trump manages to accomplish for the remainder of his term(s), is to push back the darkness a bit and keep evil from spreading throughout society, then as far as I’m concerned, he’ll be successful. Considering what he is up against, just holding back the evil is a huge effort. However, in spite of this, it is also very clear that he has accomplished much in few days. It seems very clear that there are many holdovers from the Obama regime who are working against Trump and the American people. That much is clear from the documents released by Wikileaks as well as whistle blowers who are trying to do what’s right and feel brave enough to come forward with their complaints and information. Rumors are now flying that Trump says he will work with Democrats to get something going on healthcare. That would be a mistake since it was the Democrats who gave us Obamacare in the first place. But like all rumors, we’ll see what actually transpires to judge their integrity or not. In the meantime, the world’s leaders seem to be insanely allowing Islam to do whatever it wants, providing all sorts of excuses for its violent culture of death. There are many “agents” working for globalists and against freedom. For selfish gain, they cooperate with those who intend to make the world a global society governed by one system. This problem is as old as civilization. There are people who truly believe socialism or a form of it is the world’s saving grace, though it has been clearly shown to never work in any country that has tried it. Venezuela is falling apart at the seams because of it. Yet the push toward Socialism continues throughout the world. Call it “democratic socialism,” “socialism,” or “communism,” and it’s really all degrees of the same thing, where one group of people will decide for all the rest. You’ll undoubtedly note that many world leaders today are also downplaying “nationalism” even calling it racist or bigoted. World leaders do not want average people to support their countries because those leaders see a one-world system approaching and nationalism will simply get in the way of that. This again is why Islam is useful to globalists because Islam tears away at the fabric of nationalism with its hate-filled ideology that sees only Islam as rightful dominating influence throughout the world as it seeks to build its final caliphate. Of course, Islam is not nationalistic at all. For Islam, it is an ideology of global dominance. Of course, while globalists allow it seemingly free rein (castigating those who warn against Islam’s encroachment), these same globalists will push back against Islam (so they think), when Islam has done enough of the dirty work against western civilization, values, and Christianity itself. Times are coming where this sort of evil will gain mastery over segments of society and we can see this happening in parts of Europe and the EU. It may be that America will be spared to some extent. It also may be that ultimately, America will be overtaken by the same problems overtaking much of Europe. All we can be assured of is what the Bible says will come to pass. Eventually, there will be a ten-nation federation that will successfully seek to dominate the world, as explained in Scripture – (Dan 2:31-35, 40-45; 7:7-8, 19-24 ; Rev 13:1-2; 17:3, 7, 12-16). These passages either directly or by implication prophesy a ten-kingdom confederation which will be an important aspect of the end-time political situation. This ten-kingdom confederacy has not yet occurred in all of human history. It is yet to unfold and if already fulfilled prophesy is any indication of the truthfulness of Scripture, we can be assured that it will rise as this age moves toward the final seven-years the Bible calls the Tribulation. This will be followed by a new age, the age of Messiah known as the Millennial Kingdom, the 1,000-year physical reign of Jesus on this very earth. So even if the current EU falls – and it appears that this may be happening – something else will eventually replace it. Ten nations will be the core of this coming confederacy and from that core, the Antichrist (also known as the “little horn”), will rise to the vaunted position of ultimate king. Notice this little horn removes (likely kills), three of the original ten horns so that he becomes the 8th (11th if counted among the original 10). The remaining seven horns pledge their allegiance to him. I wish you the best as you move through each day. Watch your back and understand that evil forces are at work to bring America to its knees. If you’re not a Christian (but possibly a patriot), you need to make a choice about eternity and I would urge you to deal with that subject sooner than later. The evil in the world is not going to go away. It will not reduce itself of its own volition. No president is God. One person cannot eradicate evil and in fact, God’s Word says evil will gain a dramatic hold over global society at some point in the likely near future. We certainly must be vigilant and the first step toward that is to understand the times in which we life. It is very likely if you’ve been reading this blog for any real length of time, you tend to read the same type of messages. That’s because the underlying message is often the same. Simply different scenarios are used to support the need for salvation and vigilance. It is likely President Trump will accomplish a great deal, if his start is any indication. But there are major forces working against him to keep him from undoing what has been created during the past few decades. But even if Trump is able to accomplish far more than we can ever hope, the next person coming in after him can easily begin to work to undo what he has accomplished. Life is very tenuous today. In a moment, things can change drastically. There is no guard against that but there is a guard against making a wrong decision where eternity is concerned. Entry filed under: 9/11, Agenda 21, Atheism and religion, Barack Hussein Obama, christianity, Communism, Council on Foreign Relations (CFR), Cultural Marxism, David Rockefeller, Demonic, devil worship, Emotional virtue, eternity, Global Elite, Gun Control, ISIS, Islam, Islamofascism, israel, Judaism, Life in America, Maitreya, new age movement, Political Correctness, Politically Correct, Politics, Pretribulational Rapture, Racism, Radical Islam, rapture, Religious - Christian - End Times, Religious - Christian - Prophecy, Religious - Christian - Theology, salvation, Satanism, second coming, Shadow Government, Sharia Law, Socialism. Tags: AntiFa, fascist left, fox news, free speech, islamic terrorism, protrump rallies, RINOs, rollins college florida.